Skip in his garden in Orient, New York. Rover is seated on his lap. Many garden writers whose work I greatly admire have privately shared their disappointment that our genre isn’t seriously viewed as a literary subject when compared to, say, sports or food. Every twelve months we witness the publication of an anthology titled something like “The Best American Sports Writing, 2011” or “The Best Food Writing, 2010.” There are books of “bests” for Science and Travel writing. Yes, even Nature and Environment writing has been compiled by publishers, but those topics aren’t the same as the subject of the garden. Sadly, garden writing rarely receives credit for its importance as an art form. And yet, there is wonderful work in our circles. And one of the very best pieces of literary garden writing I’ve ever read was just published this week and released by the venerable imprint Farrar, Straus and Giroux. 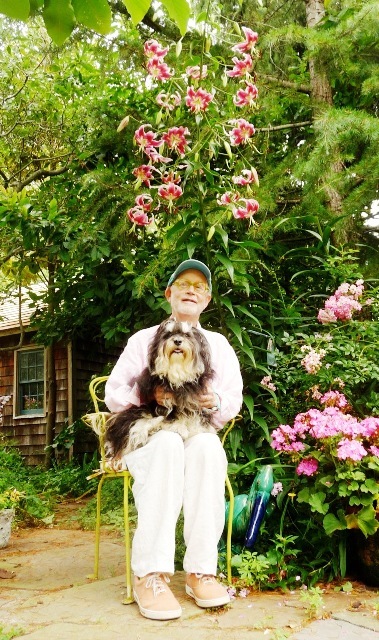 It’s a memoir called “Into the Garden with Charles,” by the late Clyde Phillip “Skip” Wachsberger, an award-winning artist twice honored by Garden Writers Association. For those of us who knew and admired Skip, his book can be viewed as one man’s life work. It’s a highly personal and yet universal story of love, friendship, and the way the garden can nurture a lonely soul. As I listened to those words, tears welled up in my eyes. I thought: How pleased Skip would have been to hear them. We lost Skip last November, when cancer took his life. That his writings, paintings and garden survive is to be cherished by those who loved him and by anyone who reads this memoir. 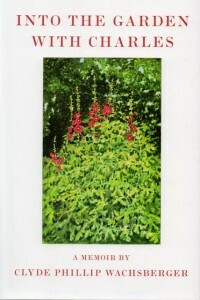 For fellow garden writers, Skip’s creative story is an inspiring one, much of it documented in the pages of his memoir. His manuscript took a decade to be cultivated – from an original garden book idea to its release by one of the publishing world’s very best imprints. Skip and I had many conversations over the years about how he reshaped his writing — from descriptions of plants and place into an intimate narrative of his own life. 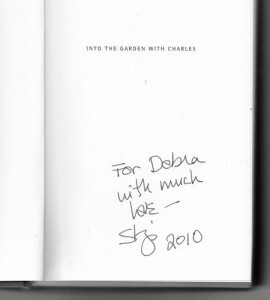 To better describe the story of this special book, I turned to the people closely involved with “Into the Garden With Charles.” In addition to interviewing Mr. Galassi, I spoke by phone with Charles Dean, Skip’s surviving husband, and Karen Braziller, his friend, neighbor and longtime writing coach/editor. They graciously shared details of Skip’s writing journey with me. 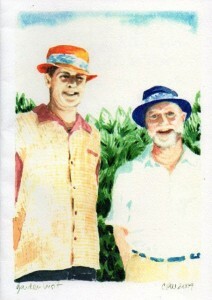 Charles and Skip in their pork pie hats. Skip printed note cards from the original watercolor. In theatre, someone who sings, dances and acts is called a “triple threat,” so I guess you could say that as a creative individual, especially in garden writing circles, Skip had his own remarkable set of triple talents — gardening, writing and painting. His gifts converge in and enliven the pages of “Into the Garden with Charles.” From the opening lines when he wonders if all that makes him happy is just a dream – his beloved but antiquated home and garden, his always-cheerful dog Rover, and his charming, Southern-born partner Charles – Skip draws the reader into his magical world in which the impossible is always possible, if you only believe. “Into the Garden with Charles” tells of a wonderful life filled with a love for opera, art, plants and friends. That Skip yearned for a companion with whom to share all of it is a familiar narrative. And just when it seems like he’ll never find the love of his life, living as he does in a remote Long Island village populated with couples and having just passed his half-century birthday, Skip meets Charles. “Every garden tells a story. Ours tells a love story,” he wrote. And you will fall in love with both Skip and Charles, as well as Rover, their loyal Havanese, and all of their plant-obsessed garden adventures. Gardeners will especially relate to the ends to which these two men go to develop an otherworldly backyard where every tree, vine or flower has its own back-story! For those who love to read lush (but not flowery) language, you will find the narrative delightful. And like a child’s storybook from days gone by, this one is adorned with beautiful watercolor illustrations, painted by the author. Allow yourself to be drawn into Skip’s dream world. You will be touched by his wisdom, kind spirit and optimism — all of it a gift from him to the reader! What began more than ten years ago as a book about gardening — starting in January and taking the reader through December, complete with a map to illustrate the location of every tree, bulb and pathway — evolved through Skip’s many rewrites. In 2010, four years after a prostate cancer diagnosis, Skip thought he had finished his manuscript. Members of his writers’ group assured him it was ready. But Karen felt one more revision was needed. He went on to invite me to purchase a copy of the book’s special edition for $100, and of course, I sent him a check immediately. I only regret that I didn’t send him $500, for 24 very fortunate supporters who contributed at that level also received one of the book’s original watercolor illustrations. Those funds helped pay for the book’s printing costs. The Studley Press of Dalton, Mass., printed the book, a lavish first edition, with heavy paper stock and vivid color reproduction. In early December 2010, it arrived in the mail: My own signed copy, No. 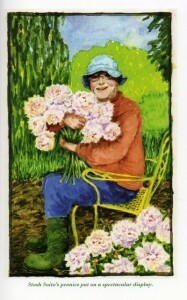 90 out of 150 numbered, Special Edition copies, its evergreen book jacket embellished with Skip’s watercolor painting of ruby-red hollyhocks in his garden. Skip’s personal note of love was inscribed on a page in the front. 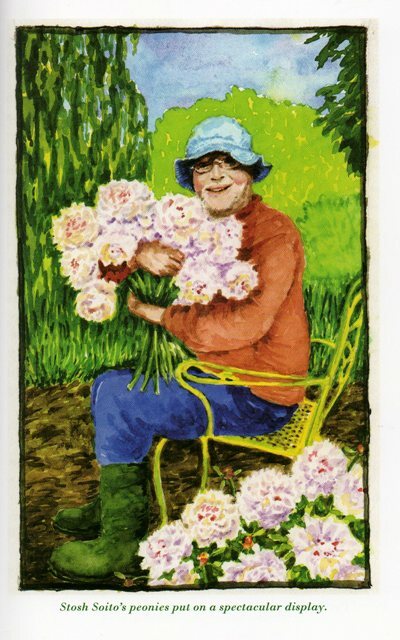 Skip's self-portrait with the peonies he inherited when moving to the house on Village Lane. You might think that’s the end of this publishing fairytale, but yet another amazing thing happened. A copy of the book made its way to Jonathan Galassi of FSG. “I was hoping to find an agent to handle (selling) the book,” Karen said. “But I also felt that FSG would be the right place for it.” She sent a copy to Jonathan, whose reputation is absolutely huge – he publishes writers like Scott Turow and Michael Cunningham. 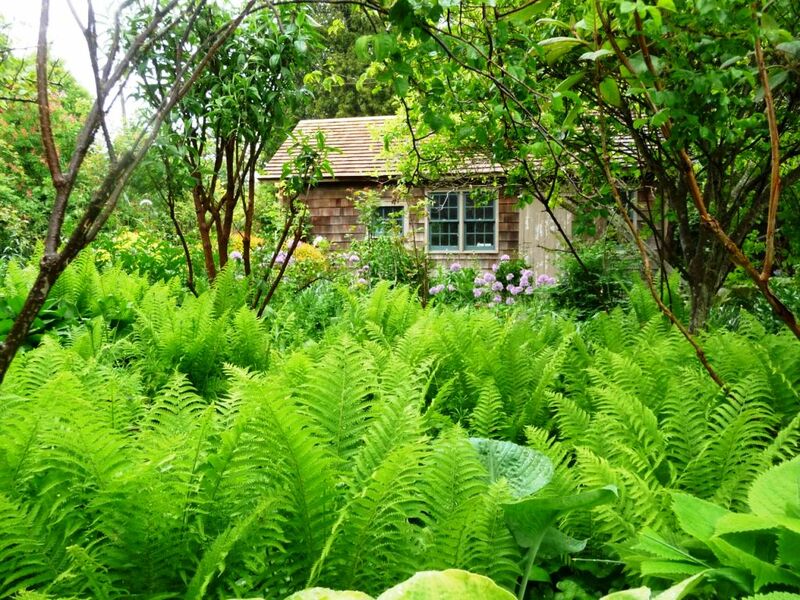 “I knew him only slightly over a long period of time, and I didn’t know that he was a gardener who also edited all of FSG’s gardening books,” Karen said. It didn’t take long to learn that indeed, Jonathan wanted to publish Skip’s memoir. Skip had several opportunities to meet with his new publisher. Jonathan visited Skip and Charles in their Orient garden and he worked closely with both of them, as well as with Karen, who continues to be Skip’s literary champion. Last year, Skip reviewed and approved (or dismissed) the small changes FSG wanted to make to the original book. He saw the final galleys, but did not live to see the book published on April 10th. “Where are you going to put that?” Charles asks, not looking up from his magazine. 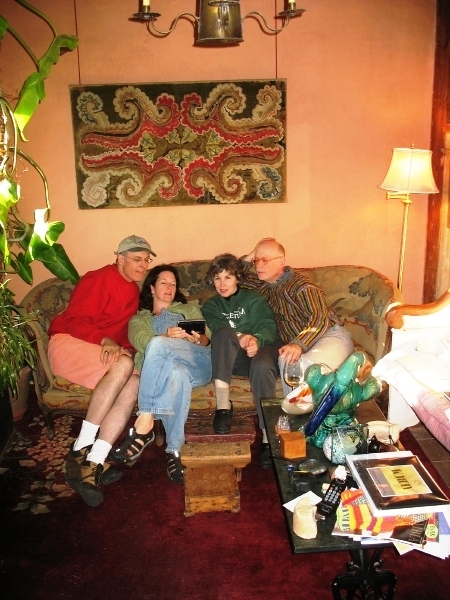 Taken in 2007, from left: Charles, me, Karen and Skip. We're probably admiring one of Skip's paintings! Many of us stumble into not-so-accidental friendships with fellow GWA members when we meet at a national symposium. That’s how I met Skip and Charles. Our friendship began in February 2002 when I received a personalized form-letter from Skip and Charles in a hand-addressed envelope. “Dear Ms. Prinzing,” they wrote. “We would like to introduce our book. It is an ideal gift for gardeners and for all readers who enjoy good stories and wonderful poems. . . .” They enclosed the publicity page about “Of Leaf and Flower,” a literary anthology they co-edited in 2001 for Persea Books. When I got my hands on it, I read the entire volume of pitch-perfect stories and poems Charles and Skip had carefully selected. And I admired the botanical illustrations from Skip’s original Sumi ink paintings. I wrote a short but positive review for “Garden Notes,” the Northwest Horticultural Society newsletter I edited at the time. One tall and one short, but wearing his-and-his pork pie hats (Charles in orange and Skip in turquoise), this charming pair became my instant friends. I was smitten by their magnetic enthusiasm for everything horticultural, especially the Seattle gardens and nurseries we toured during GWA’s four-day symposium. Skip received his GWA Gold Award and he and Charles left Seattle extracting a promise that I visit them whenever I headed east. A walk down the pathway leads to many horticultural surprises. That chance arrived in 2004 when GWA’s symposium was held on Long Island. 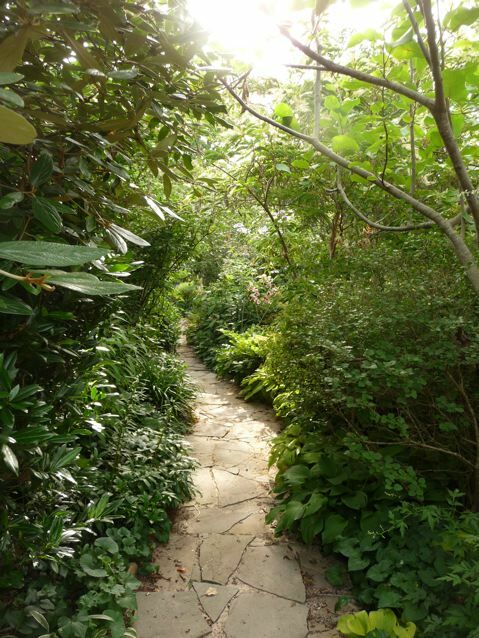 I finally got to see the amazing garden upon which Skip lavished all of his love and creative energy both before he and Charles became a couple, and after, when they gardened there together. 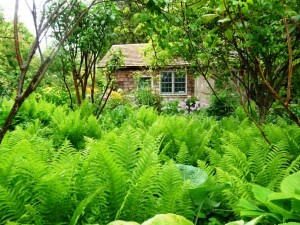 Stepping into their abundant, charmingly-chaotic garden, I held my breath. Skip’s past career in theatrical set design clearly influenced his choices about the placement of specimens – either for the way their leaves caught the sunlight or how a higher branch provided scaffolding for a climbing rose. Escorted by Charles and Skip, who provided me with a running narrative about the provenance or genetic ancestry of each tree or shrub, I took the full circuit, moving from one verdant scene to the next. A masterpiece! Over dinner, before they drove me back to the convention hotel, I met Karen, whose obvious love for and friendship with Charles and Skip somehow spilled over to me. Our friendship deepened and continued, despite my living on the west coast and the three of them living on the east coast. The takeaway for anyone reading this (long, I know) piece is that you never, ever know who will influence you and your work. Knowing Skip made me aspire to be a writer whose work is personal, authentic and relevant. Through his wonderment and love for both the natural world and the cultivated garden, and through his purely joyous outlook, Skip enriched my life and taught me much about being a writer. I’m so glad I can read his words again, and again. Special thanks to Charles Dean for sharing his photographs of Skip and the garden. 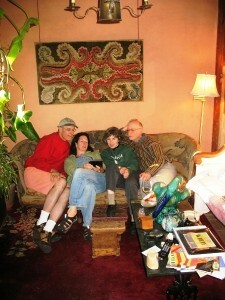 The group photo of Charles, Karen, Skip and me was taken by William Wright. This entry was posted on Friday, April 13th, 2012 at 4:40 pm	and is filed under Book reviews, Creativity, Gardening, General, Writing. You can follow any responses to this entry through the RSS 2.0 feed. You can leave a response, or trackback from your own site. What a wonderful, personal and relevant review! If the book is half as charming as what you just posted, it must be positively fantastic. I can’t wait to read it. Beautifully written. Thank you for writing and sharing this with your readers. I still can’t believe Skip is gone. this is so inspirational. i love to read it. i bet there would be more but “The lush, layered garden created by Skip and Charles” is truly beautiful. A lovely article and tribute, Debra! that it is truly informative. I’m going to watch out for brussels. I will be grateful if you continue this in future. Many people will be benefited from your writing. Cheers! What a wonderful post! I just finished “Into the Garden with Charles,” and was hoping to spend some more time with the author. I wasn’t ready for the book to end. Skip and Charles’s garden sounds wonderful. I loved that book – absolutely loved it. I have recommended to others. Please more like that or of that quality. –I love this book also! –Karen has published many of my print books! –I hope that “Sandy” didn’t devastate this garden! –I reach this book in my English class at the University of Michigan –at least there’s a form of longevity in the book; I have a Kindle e-version and an iBook –love both of them! Just finished reading the book and feel like I had known him. From your account, it sounds like he was a very special person indeed, and I’m sorry I never met him in person. What a lovely review — as wonderful as the book itself, which I now cherish. Thank you!